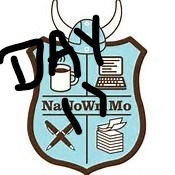 Well it’s now Day Eleven of NaNoWriMo and I surprised myself by actually hitting my goal and wrote 3,908 word today! That brings my total word count up to 18,782. With any luck I’ll be at 20,000 words tomorrow. Hooray!! 🙂 Now if everyone has been keeping track of their word counts you should be at about the same word count I am by the end of the day. Now the almost 4,000 words in one day is usually not me. I can stick to my 1,700 goal a whole lot easier. But today I took a more relaxed approach to my writing. I went to my “Google Play” option and chose “Ottmar Liebert Radio” and just let the music flow through my writing. It helped my mind relax and think of words for my dialogue parts which I often have difficulty with. I know a lot of you who write may have their own music playlists which have songs with (or without) words. Usually when I have music on while writing, I let my CD player just play at random. Believe me for this player random play is enough, it has 300 CD’s in it. But today I felt like listening to a specific style of music while writing and Google Play allows me to do that. So with this article/blog I encourage you to pick your favorite artist, choose him/her on Google Play and see what comes up. You may be surprised and even find a new artist you like. As always, keep your pens and computer keys going.